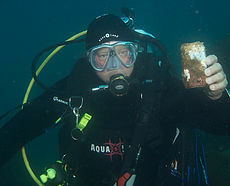 I started diving in 2003 when my wife, Bonnie, gave me a gift certificate for SCUBA lessons at Sonoma Coast Divers (then, Sonoma Coast Bamboo Reef). Tom Stone helped me through the process and Steve Johnson was my instructor. Gaining my Open Water Diver certificate was the culmination of many years of love of the ocean and a desire to see more of our underwater world. As a kid I grew up with “Mike Nelson” (Sea Hunt) and of course Jacques Cousteau and was fascinated with the thought of actually breathing underwater and exploring new worlds. The notion that I could now join them is still a dream come true! Not content with an entry level certification, I continued to dive and gained experience in deep diving, navigation, photography, physiology, and sharing what I had learned. I achieved levels of Advanced Open Water Diver, Stress & Rescue, and turned to the professional side, becoming a Dive Control Specialist in 2009. I maintain a certification as a Dive Emergency Specialist through DAN and at present I have completed the Instructor Training Course for Open Water Instructor. I will complete the final evaluation for that in the summer of 2013. I am also a volunteer Scientific Diver at the California Academy of Sciences, Steinhart Aquarium where I have served for the past three years. It has been my privilege to dive all over the world and I have enjoyed many visits to the Philippines, Fiji, Bahamas, Roatan, Belize, Hawaii, Virgin Islands, Grand Cayman, and the Channel Islands of California. 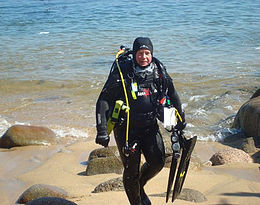 I love our north coast diving as well, and dive Monterey and Salt Point areas frequently.